HOME > Topics > ice packs, icekap, migracap, therapearl > What's your favorite ice pack? What's your favorite ice pack? 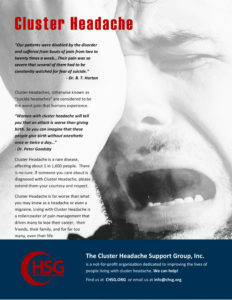 Welcome to the Cluster Headache Support Group! › Forums › CH Basics › What's your favorite ice pack? This topic contains 2 replies, has 3 voices, and was last updated by Linda Maul 1 year, 7 months ago. I have tried several over the years. First, I started with a basic ice bag that I could fill with ice cubes. These are great at home, but harder to use out and about. As a result, I still keep a few on hand for home use. Next, I tried several shapes and sizes of Theraperl ice packs. I would give these a A+ except for the tendency to crack open at the seams. About a year ago i had the opportunity to try some more sophisticated, wearable ice packs. That’s when I discovered MigraCap and IceKap. Both work perfectly. MigraCap is soft and flexible – perfect for sleeping, where the IceKap works best when I need tight compression. Consequently, they have become my preferred options. I pack them both in a soft-side cooler which keeps them cold all day. This setup is perfect for travel.